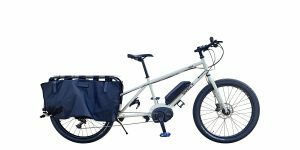 The Load is a spectacular electric bike… it’s an ebike with a trunk! A sporty, front-mounted trunk that’s suspended to protect your valuable items or little people. 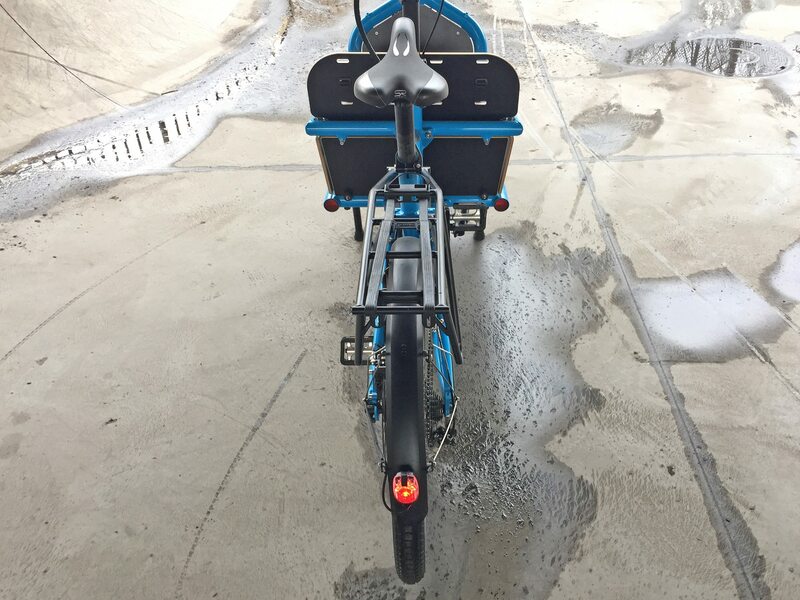 For this review, I met with Chris Nolte, the owner of Propel Bikes, under the Brooklyn Queens Expressway at the Golconda Skate Park in Brooklyn New York. 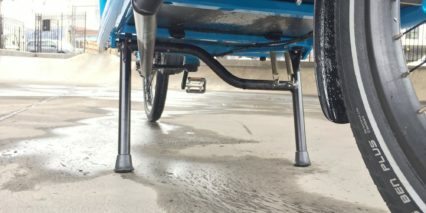 It just so happened to be raining, so this covered skate park gave us an opportunity to stay dry and experiment with curbs and ramps, testing out the front and rear suspension systems. The Riese & Müller Load comes in four flavors, two with high-torque Bosch CX motors and two with the Bosch Performance Line Speed motor offering 20 mph and 28 mph top speeds respectively. 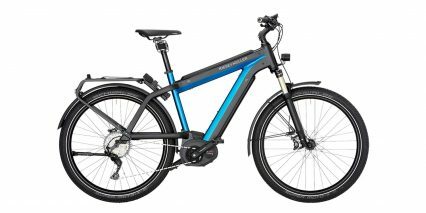 You get to choose from a traditional ten-speed Shimano Deore XT drivetrain with sprockets or the NuVinci continuously variable transmission which is slightly heavier but can be shifted at standstill. 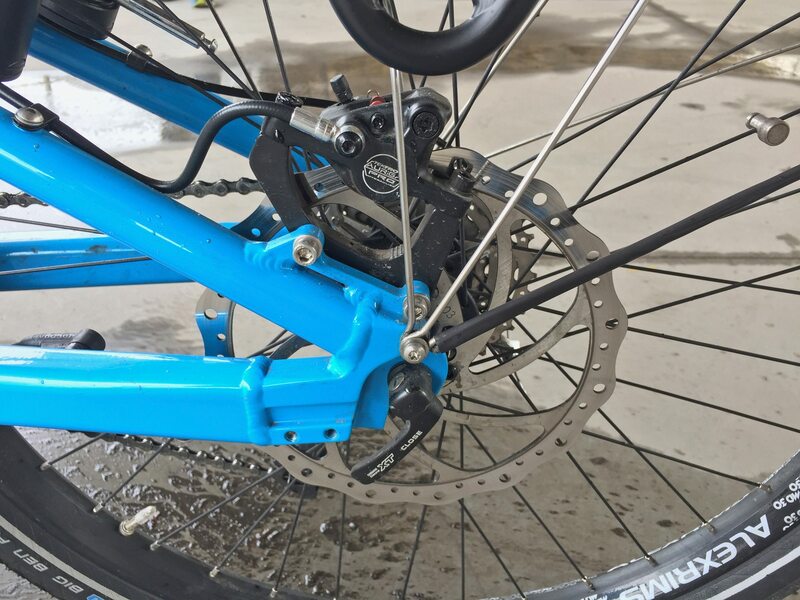 Both use chain drives vs. belts because of the way the the rear swing arm is setup. 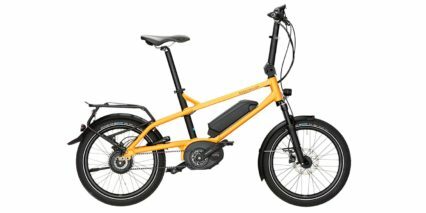 The specific model I test rode in the video review was the Touring HS which is the 10-speed high-speed option. 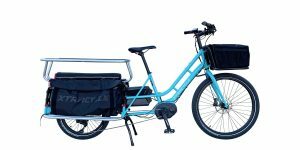 I wasn’t sure how I’d feel riding a cargo bike above 20 mph but came away very impressed and excited. 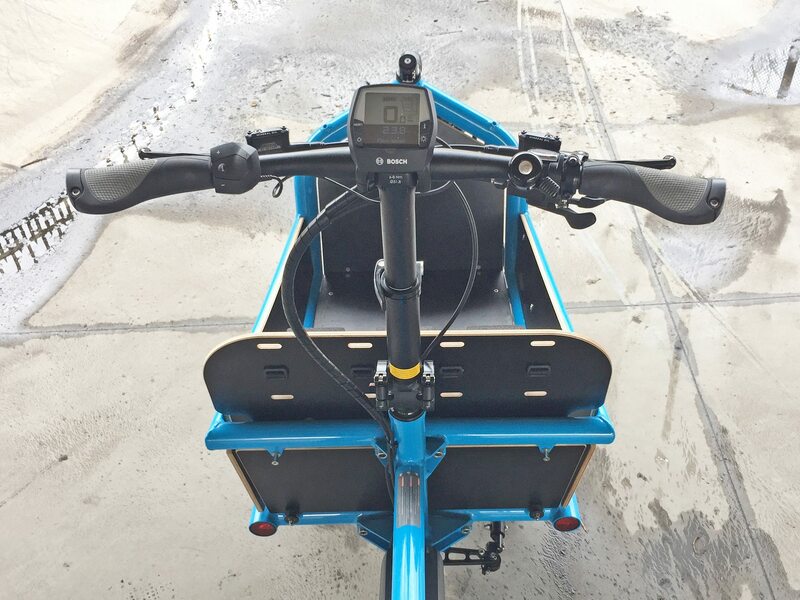 This product behaves a lot more like a standard ebike than a cargo model, the two-wheel setup is easier to turn and maneuver than other three-wheled cargo bikes but you still get a front bucket that’s easier to manage while riding… you just look down. For those with an infant or young children, the front-bucket gives you more chances to communicate and eliminates the need to twist backwards or look over your shoulder and perhaps get distracted while also managing gears and assist level. 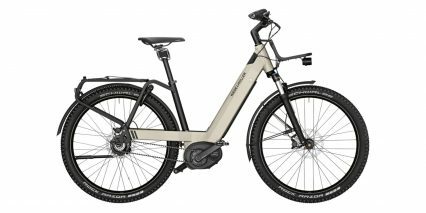 While the frame only comes in one size, the extra-long seat post, telescoping stem, and adjustable angle on the stem make it versatile. 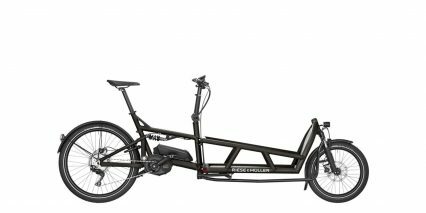 You can adapt the bike to fit tall and short riders, and as the seat gets raised, it naturally moves backwards because of the angle. 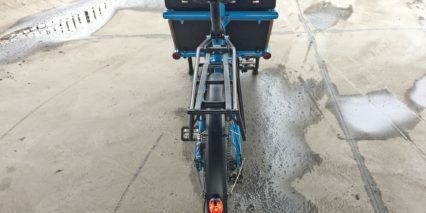 I enjoyed the soft gel saddle, ergonomic grips, and medium-sized city tires. They smoothed out the bumps but still felt efficient, and they also increased safety. Notice the silver stripes of reflective material lining the sidewalls of the tires? These strips are highly visible in low lighting conditions and compliment the front and rear LED lights that run off the main battery pack. These lights are thoughtfully engineered and upgraded from the generic products I see on entry-level ebikes. The headlight is mounted in such a way that it points where you steer, it has windows on the sides to help you be seen from multiple directions, and it has a cutoff section towards the top so it won’t blind oncoming traffic. 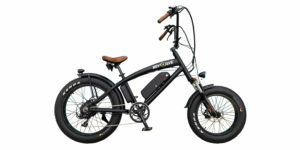 By default, with the high-speed version of this bicycle, the lights come on automatically, any time the bike is powered up. 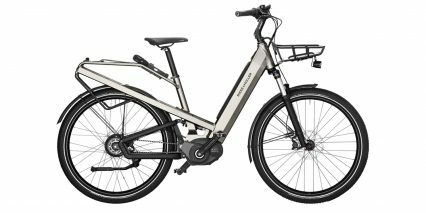 The final safety option comes down to your style preferences, Riese & Müller offers the Load in four colors including white. 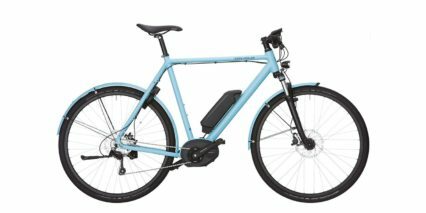 This option would be the most visible at night when riding in traffic, but the Lime Green would also be a good choice and I have to admit, the Cyan Blue looks beautiful. I guess Black is alright for people who want a more masculine look or are going for timeless. The standard touch points are black and silver but Riese & Müller offers five alternative colors to really spice things up. 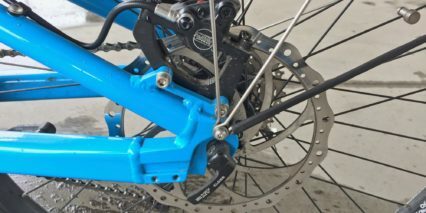 If you choose one of these alternatives (including a replacement for the standard black) they install SALTPLUS BMX parts instead. 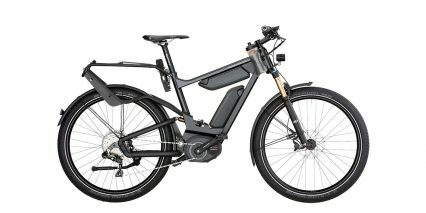 And this brings us to one of the big considerations with any Riese & Müller e-bike product in the US, aside from price, you have to custom order it because they build to suit. This adds additional wait time (from one to two months) from the moment you decide to pull the trigger. Driving the Load is one of two motors, as mentioned earlier, but they have a lot in common and I believe the underlying hardware is the same. 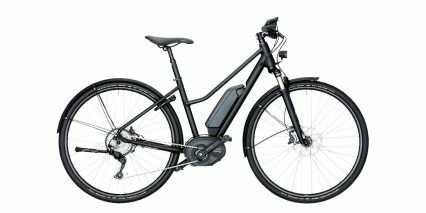 Bosch is the maker, and they’re one of the best and most sought after in the market at the time of this review. 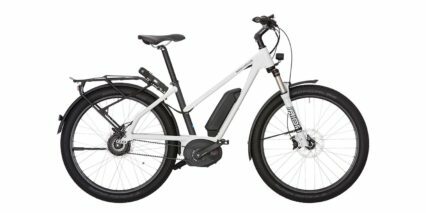 You may have heard about Bosch before ebikes because they also make power tools, car parts, washing machines, and a whole range of other heavy duty hardware. This motor system is in its third generation and I hear from shops all around the world that it is one of the most reliable. 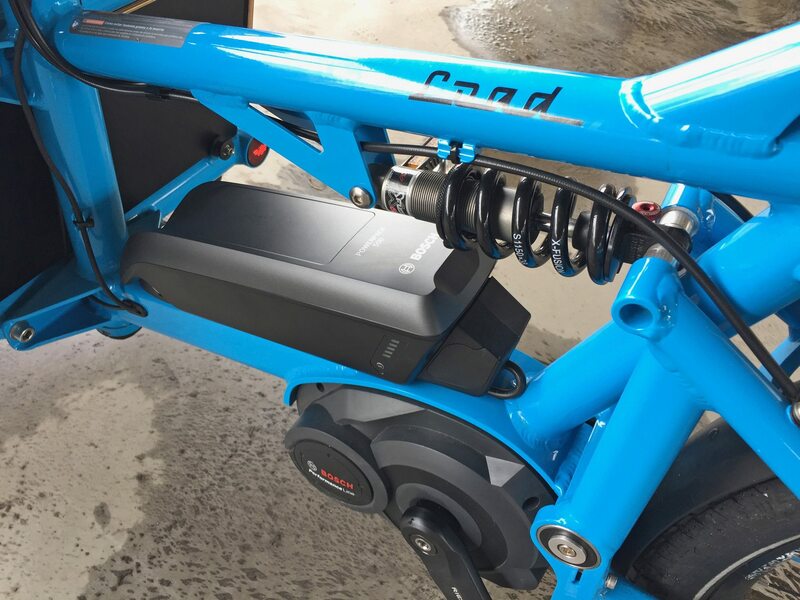 The controller measures rear wheel speed, pedal speed, and pedal torque, one thousand times per second! It uses this feedback to help you start from rest more easily. And that’s a big deal given the 73 lb unloaded weight of the Load. 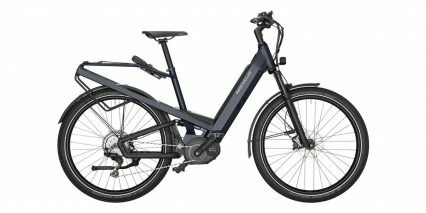 If you’ve got kids or cargo in there and are starting on an incline, a motor like this is ideal… and perhaps the NuVinci CVT drivetrain, which can be shifted at standstill. 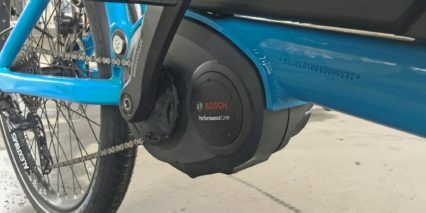 In addition to pedal signals, the Bosch controller also listens for shifting signals and eases power off so the motor won’t strain the chain, sprockets, or derailleur. 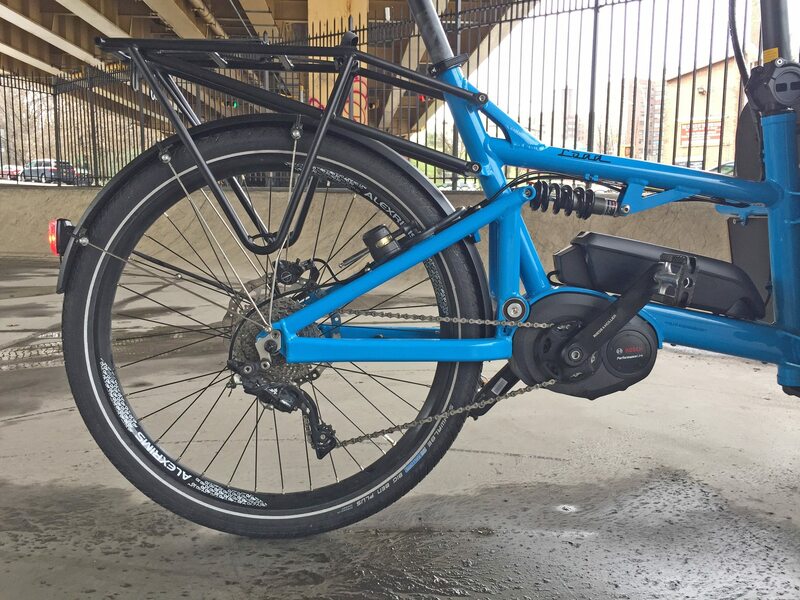 It’s not a foolproof system because you NEED to shift hard sometimes and it’s important to have motor power kick in based on riding first, so you can still mash the gears if you’re not thoughtful. I usually ease off a bit when shifting… it works pretty well and it’s something you get used to. This motor is positioned low on the frame and reduces unsprung weight compared to a hub motor. It improves balance front to rear and has a plastic cover to keep it protected from minor bumps and scrapes. Note that the chainring is extra small compared to traditional hardware. It spins at roughly 2.5 times your own pedal speed and produces a high pitched whining noise at the higher RPM levels. You can see and hear it in the video, and there’s a plastic cover to help your pants or dress sluff over the side vs. getting greasy and snagged. Powering all current versions of the Load is one or two Bosch Powerpack 500 batteries. This pack is 25% larger than the second generation pack which offered roughly 400-watt hours, but only weighs 0.3 lbs more. 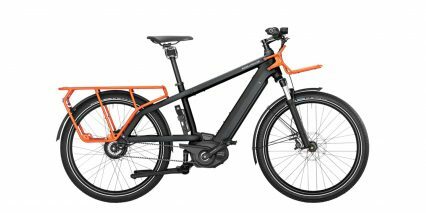 It looks nearly identical and the mounting interface is actually backward compatible so you can use older batteries you might have from previous electric bikes. 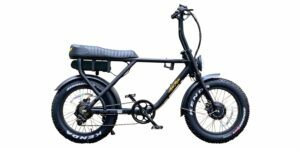 While the pack is not as integrated as some of the fancier road and mountain bikes, it is easy to access, charge on or off the bike, and protected from all sides by frame tubing. 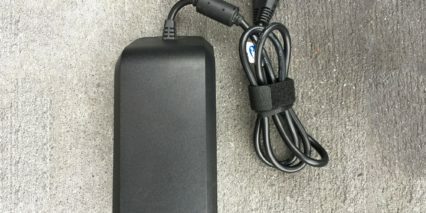 If you opt for a second Powerpack 500, which must be done at the time of original purchase because it requires a different display, they will add a mount on the back-left of the cargo box. 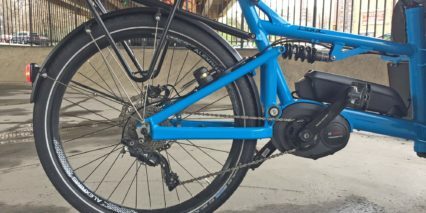 This does imbalance the bike very slightly, but keeps the pack out of harm’s way, protecting it from frame bumps and water. I love that all versions of the Load come with front and rear plastic fenders. These won’t bend like Aluminum, they won’t rust like Steel, and they tend to be very light… but can rattle. So R&M have reinforced them with extra support arms. Notice how quiet the bike rides in the video review when I mount my camera in different locations. 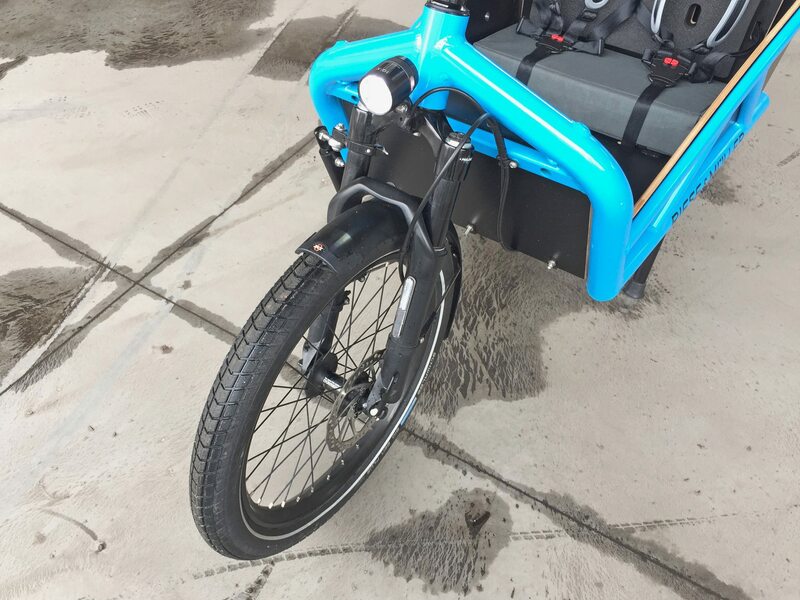 The fenders are different sizes because the wheels are different sizes. 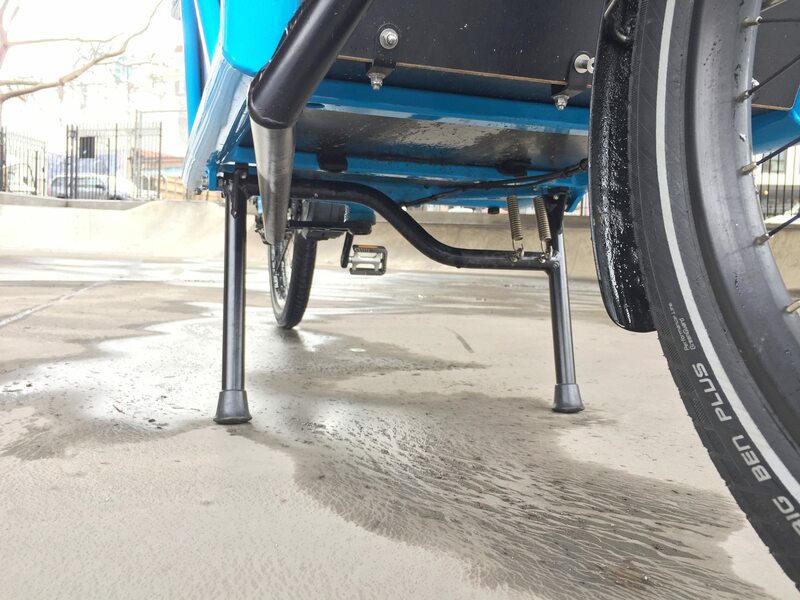 From a design standpoint, this makes steering easier, allows you to see down in front of the bike easier, improves the strength of the front wheel, and lowers the center of gravity on the bucket. When you really study the frame, you start to appreciate the excellent ground clearance between the wheels but also how low the front box is, making it easier to load or climb into for kids. Operating the bike is intuitive and fast. Once the battery pack is charged and mounted and the display is also in place (since it can be removed) you just press the power button at the lower left corner and it blinks to life. From here, you can see your speed, battery level, assist level, a power output indicator, and trip stats. Pressing the information “i” button on either the display or button pad mounted near your left grip, will cycle through the stats including odometer, clock, max speed, range, and others. Range is cool because it updates instantaneously as you use the plus and minus buttons to select different support levels. 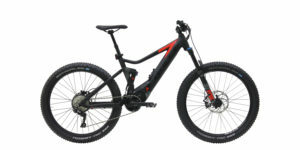 I usually ride in Tour which is one step up from the lowest Eco. This maximizes range while still feeling comfortable. 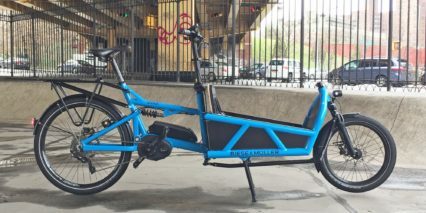 For the review, I rode around in Turbo to hit the maximum 28 mph assisted speed. You might notice that the motor fades out quietly when approaching the top speed. 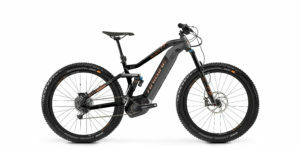 It feels smooth and keeps the bike stable vs. an abrupt on/off feeling that cadence sensors and throttles can produce. 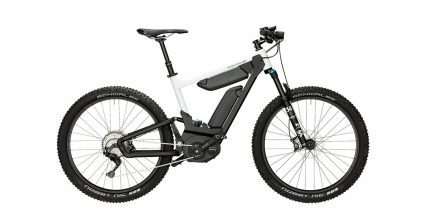 The bike is constantly listening to how you ride, how much battery capacity is left, and what assist level you’re in to keep its range estimate fairly accurate. 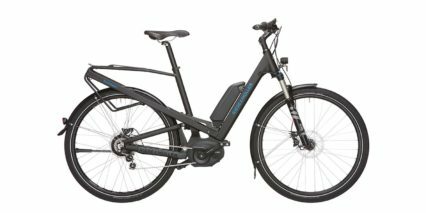 Considering that you’ll have 10 gears or a CVT to work with, the bike can certainly be pedaled without power, but it might be best to conserve energy using Eco mode vs. running out on a longer trip. The display panel itself is large, easy to read, adjustable in terms of angle for reduced glare, and it has a Micro-USB port built into the top right edge. 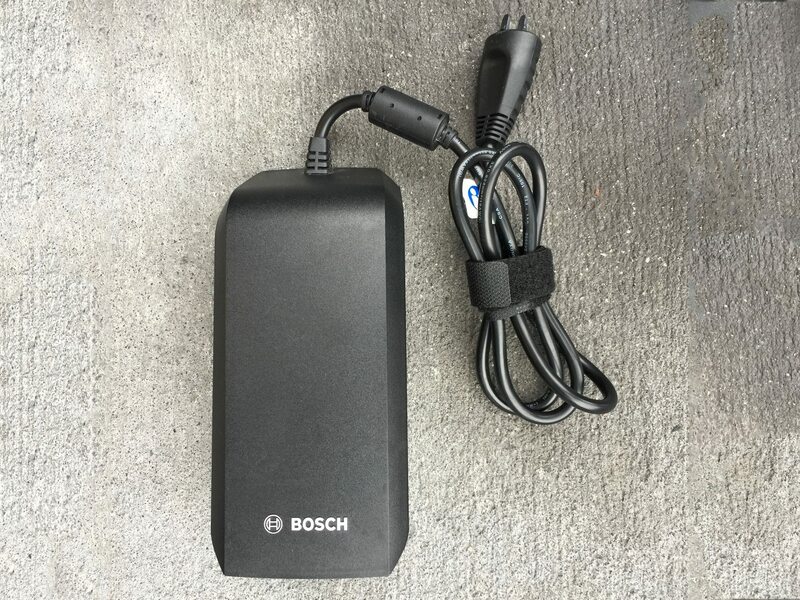 I have used this to maintain my iPhone for use as a GPS but it could also charge a music player, secondary lighting system (like holiday lights if you added them to your frame) and other portable electronics. For those who mightuse the Load as a car replacement, I’d recommend always taking the display off when parking outside to reduce sun damage and potential scratches from other parked bikes. 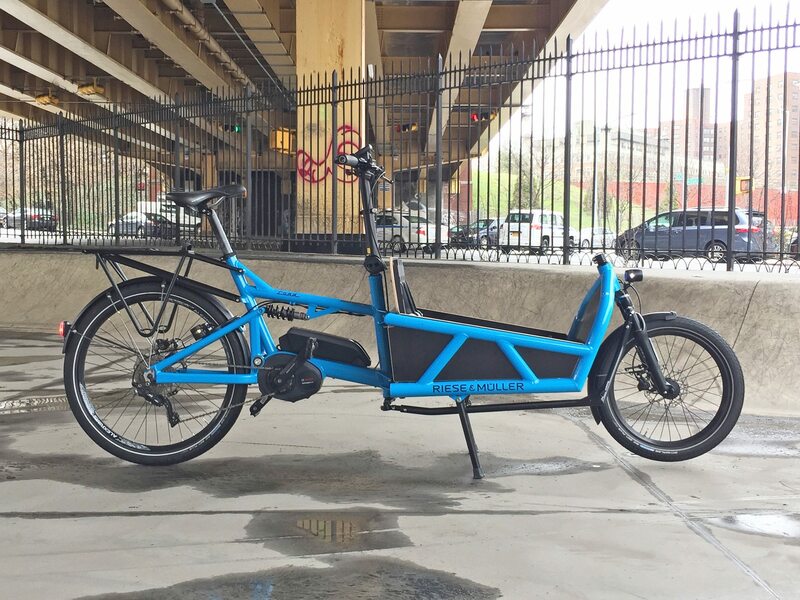 You can park this bike differently than most because it has a sturdy double-leg kickstand and doesn’t need to lean against a rack. 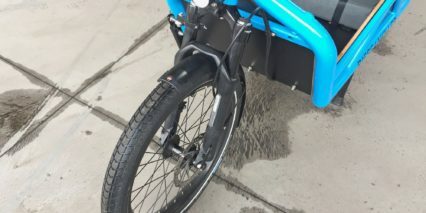 It comes with a cafe lock to disable the rear wheel (a rod slides through the spokes so it can’t turn) and since the bike is so heavy, someone would really have to work to lift and run off with it. 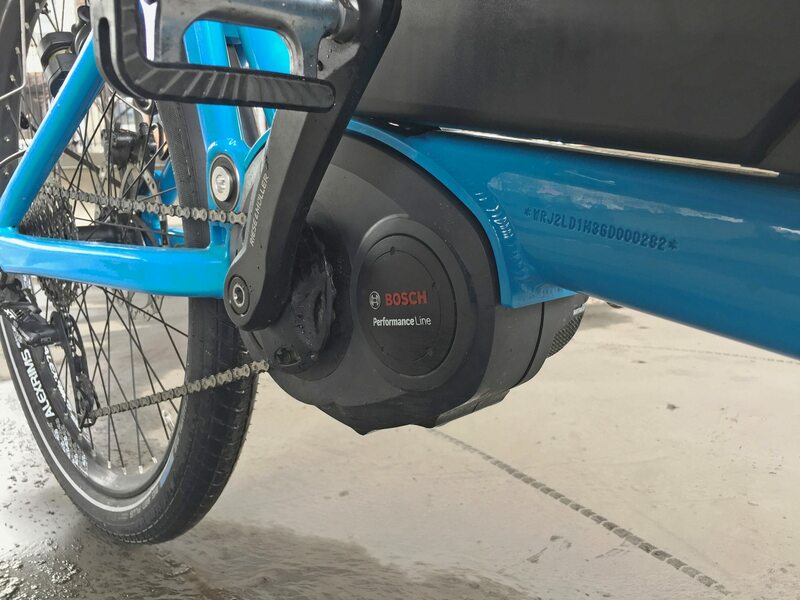 Both wheels offer quick release, which is nice for maintenance and transport, but use a cable lock to secure them when parking for long periods because the wheels and tires could be taken. 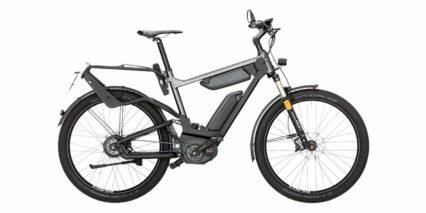 As cool as the Riese & Müller Load Touring HS e-bike is, there are some complaints that I’ve heard about from actual owners in parts of Europe (where it has been available longer). The cargo area is just barely large enough for two children, many parents have opted for the longer Packster 80 instead. The five-point harness system that comes with the child bench seat can be difficult to snap when your child is squirming because you have to juggle multiple parts at once… but at least they stay put once you’ve got it! I noticed and hypothesized that fingers could get squished if kids are holding onto the side of the bucket because there isn’t an outer guard. Keep this in mind when squeezing through tight traffic or walled pathways. 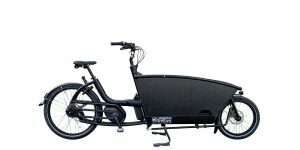 But again, the upsides are many with two-wheels and a narrower cargo bin. 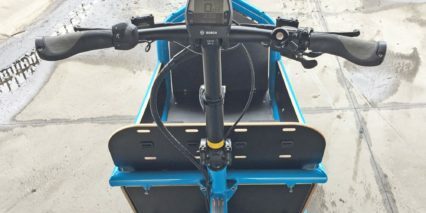 You can turn quickly, avoid bumps and potholes easily because the wheels are in a line vs. spread out on three-wheeled cargo bikes. 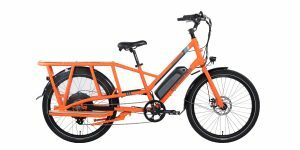 I came into this review thinking that I didn’t need or want an electric cargo bike because I’m a young man without kids who is capable of wearing a backpack. 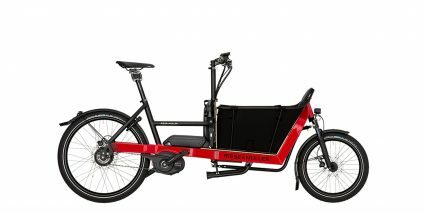 But I came out feeling like this was the Audi station wagon of electric cargo bikes! 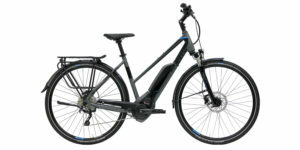 It’s fast, sporty, comfortable, great looking, and utilitarian. I don’t love wearing backpacks… it would be easy to toss my laundry, bookbag, groceries, gym bag, etc. into the front and zip away instantly. 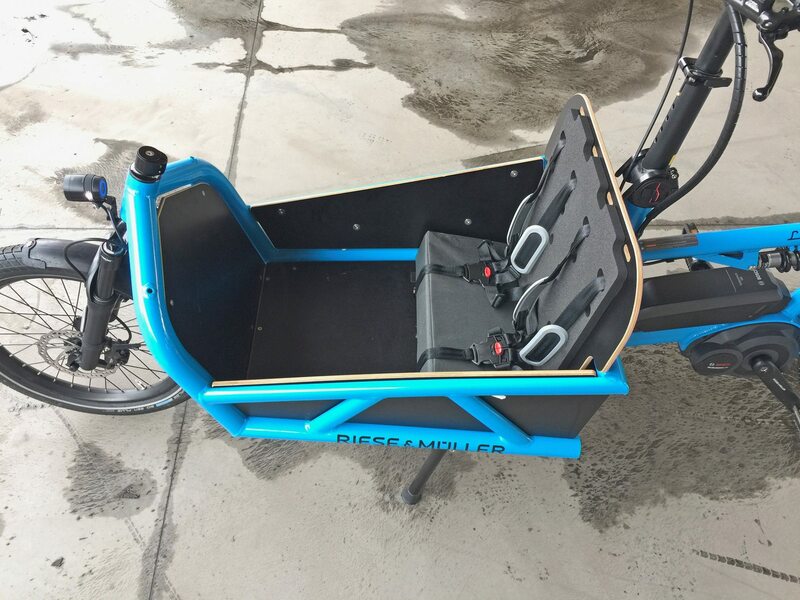 I could even get the suspended rear rack for use with a pannier and keep the front open for my dog, so we could cruise to different parts of town for our walks. 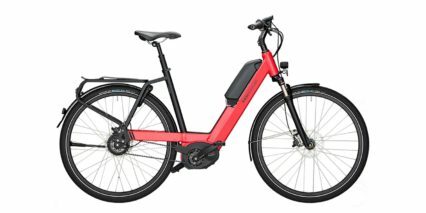 In my opinion, this electric bike is really fantastic and it comes from a company I trust that is relying on other companies that I trust to deliver a safe, long-lasting experience. 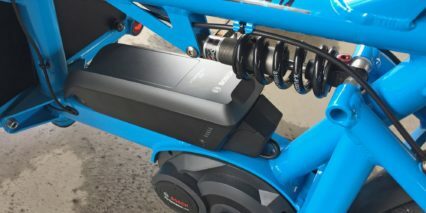 You’ll be able to find replacement battery packs long into the future and even though it will be annoying to replace two different sized tires, I think the improvements in handling and stability are worth it. 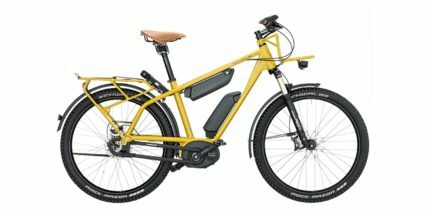 Just choose your color, drivetrain, top speed, and battery options wisely! 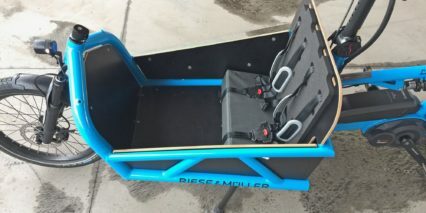 Big thanks to Riese & Müller for partnering with me on this post and to Chris for risking his life riding the Load down stairs… I can’t believe it worked so well, even when we bottomed out a bit on the second pass. 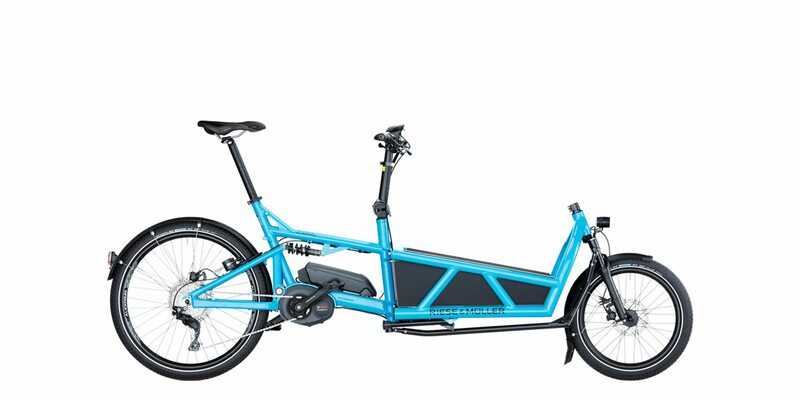 It really resonated with me when you described this bike as sort of an Audi station wagon. I drive a Subaru Outback, but get the point – this is what most people really need and can do anything you need it to. 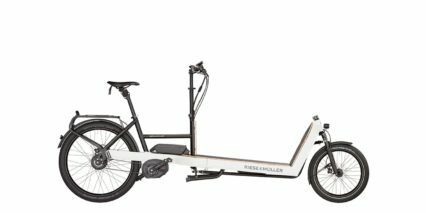 My only question is whether long wheelbase bikes like this will fit on a standard 2-arm hitch mounted rack, or will need to be supported at both wheels.